Whether you step forward with a hardwood frame and rawhide lacings or with a more modern shoe, the wide open terrain at New England Outdoor Center will provide hours of unlimited exploring and adventure. 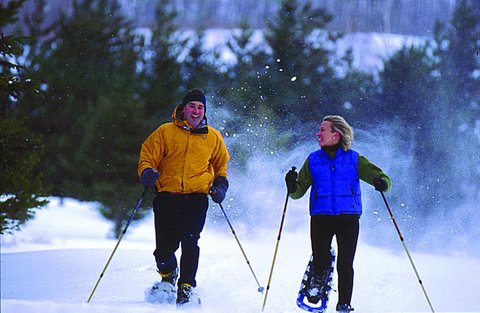 Enjoy snowshoeing in Maine right from your cabin door, or skiing or snowmobiling. Whichever winter sport suite you best. Baxter State Park is one of Maine’s wild and untouched places. It offers miles of navigable trails to admire Maine’s rugged, natural beauty. Snowshoe rentals are included with all winter lodging packages (based upon availability). Adults and children can also rent snowshoes for just $20 per day. Call 1-800-634-7238 to ask us about the current weather conditions and to customize your perfect winter experience.